Beth Horton, Ph.D. is an Assistant Professor in the Department of Public Health Sciences, Division of Translational Research and Applied Statistics. Her research involves developing more efficient tools to evaluate the utility of screening tests. 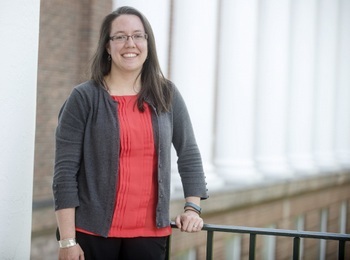 Since coming to UVA, she have gained interest in early phase clinical trial design. Before moving to Charlottesville, she received a Ph.D. in Biostatistics from the University of North Carolina at Chapel Hill in May 2014. She has enjoyed living in Charlottesville and taking advantage of so many things offered here, from concerts to the mountains and local orchards. Before coming to UVA, my research focused on efficient sampling design for evaluating the effectiveness of screening tests. Our goal was to identify and sample subjects with the most information to use in our models to improve study efficiency, allowing us to reduce study costs and decrease subject burden by enrolling fewer patients in the study. I used data from a non-small-cell lung cancer study to evaluate the ability of a proposed screening test to identify patients with a high risk of cancer recurrence so that a more appropriate treatment plan could be used for those patients at high risk. I used covariate information, such as age and gender, to help identify subsets of the population where the screening test performed better at predicting cancer recurrence. I’m looking forward to improving and adapting these methods for collaboration in cancer research at UVA. Since coming to UVA, I have begun research in early phase clinical trial design, where the focus of this research is on selecting the best doses to move forward to the Phase II trial and efficiency in allocating study subjects to the most appropriate dose.